And it was vividly, viably virtuous. Yes, David Varley (formerly of the loved-but-short-lived DJT) is alive and well in Washington (D.C., not Iowa), ably assisted by Pastry Chef Santana Salas (she, formerly of Sea Blue), and soon to be joined by Adam Sobel, and cooking his little ham pickin’ heart out in the Four Seasons Hotel in Georgetown. Which means Vegas’ loss has been D.C.’s gain…and whoever let these talents slip out of town should be shot. Because if ELV has learned anything in his five decades of life (three of which have been spent in the High Mojave), it’s that Vegas isn’t about nurturing talent — be it in music, art, writing, comedy, acting or food — but rather, about cashing in once a reputation and Q rating has been established elsewhere. 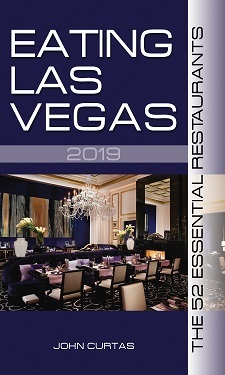 Culinarily-speaking: Las Vegas is a training/proving ground for young chef talent, who, like many talented professionals, often have wanderlust in their veins. Thus, will the good-to-great ones often leave seeking greener pastures. So good for them and good for us. Because if ELV has learned something else from his years around here, it is that many a person moves to Vegas, moves away, and then returns. Which, in the long run, makes both them and Las Vegas a better place. As for Varley’s vittles? They were &%^%*$# fantastic. Hyper-delicious. Fork-dropping-ly great. Innovative, but grounded in strong, primary flavors and textures, and instilled with his unique ardor and talent for all things gastronomic. Most of what he served us was off the menu, but from his house made charcuterie (with bacon-cheddar marmalade…yummm! ), to sea urchin pasta napped with lardo to a marrow and beef tendon risotto (that tasted like an unctuous-umami-bomb), every dish was infused with passion that we don’t much see around our humble burg. Bourbon Steak is a steak house to be sure, and an excellent one (our rib-eye and strips were as beefy and mineral rich as these cuts get), but Varley’s vital virtuousity deserves voracious vociferousness…whether he’s vacated this venue or not. Chefs, Food, ReviewsAdam Sobel, Bourbon Steak, David Varley, Georgetown, Michael Mina, steakhouses, steaks, Washington D.C.